Vernaccia was first mentioned in 1276, when the Commune of San Gimignano put duty on this precious wine both for imports and exports. The origin of this vine is uncertain, but its cultivation quickly spread all over Tuscany, in Liguria, and in many other regions in Italy. The production in San Gimignano was renewed for its excellent quality. Medieval Vernaccia was probably a white, sweet and alcoholic wine, very similar to the “Greek” wine, so popular at that time. Vernaccia was much appreciated by important personalities, such as Pope Martin IV, poets like Dante Alighieri and Giovanni Boccaccio, powerful governors like Ludovico il Moro and Lorenzo il Magnifico. 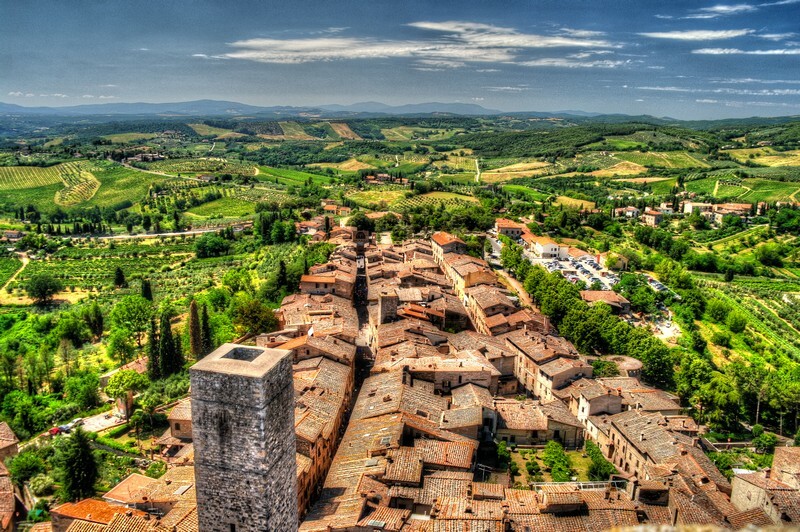 In the seventeenth century, the poets Gabriello Chiabrera, Francesco Redi, and Michelangelo Buonarroti “il giovane” celebrated again Vernaccia di San Gimignano. “It kisses, leaks, bites, pricks, and stings (“Bacia, lecca, morde, picca e punge”) wrote Michelangelo in his “L’Aione”, in 1643. After a long period of decay, Vernaccia di San Gimignano is today back to its excellent standards, thanks to the commitment of local vine-dressers which joined in a Syndicate obtaining the first DOC in Italy in 1966 and later DOCG in 1993. Today Vernaccia is one of the best white wines in Italy. Vernaccia has a typical straw-yellow colour with golden nuances enhanced by ageing. Vernaccia boasts an elegant and delicate bouquet, with fruity and flowery notes. After Refinement and ageing it develops its typical mineral nose of flint. On the palate it is a dry, harmonious, sapid wine, with a typical almond after-taste. Perfect foil with fish, white meats, vegetables, Tuscan ham, “ribollita” soup and many summer dishes.